June 4, 2013  The next step is a mental evaluation of Holmes that could take months. Holmes is accused of killing 12 people and injuring 70, when he allegedly opened fire at a midnight screening of The Dark Knight Rises in Aurora, Colo.
May 13, 2013  Charged with 166 counts of murder, attempted murder and other crimes, James Holmes is accused of opening fire on the crowd at a midnight movie last July in Aurora, Colo. Twelve people died and an additional 70 were wounded. May 7, 2013  Holmes is accused of opening fire in a crowded Aurora, Colo. movie theater, killing 12 people and injuring 70. April 4, 2013  Campus police decided to deactivate Holmes' student ID. 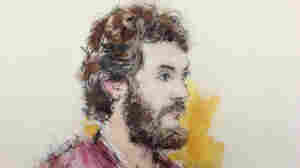 His psychiatrist said she was worried because he was making "homicidal statements." April 1, 2013  James Holmes had offered to plead guilty in exchange for a life sentence. Prosecutors called that a publicity ploy. Twelve people died and another 58 were wounded in the attack. March 28, 2013  The prosecution said they had not received any details from James Holmes' attorneys, so they weren't prepared to accept a plea. March 12, 2013  James Holmes faces 166 counts, including murder, in the shooting deaths of 12 people and wounding of another 70. His attorneys said they aren't yet ready to make a plea, so the judge did it for Holmes. 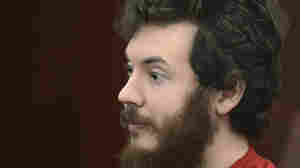 March 11, 2013  The judge in the case said if James Holmes pleads not guilty by reason of insanity, he could be interviewed using a truth serum. Holmes is expected to enter a plea in a hearing on Tuesday. January 10, 2013  James Holmes is accused of opening fire at a movie theater in Aurora, Colo., last summer, killing 12 people and wounding dozens of others. He will be formally arraigned Friday on 166 counts of murder, attempted murder and other crimes. January 9, 2013  In the weeks before the attack, James Holmes took photos of the Colorado movie theater where 12 people were killed and dozens more wounded in last summer's mass shooting, prosecutors revealed Wednesday at a court hearing in Colorado. January 8, 2013  On a 27-second call to police, at least 30 shots can be heard in the background. 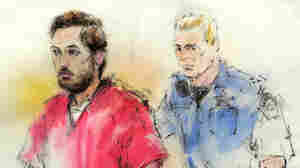 James Holmes is charged in the murders of 12 people and the wounding of dozens in a movie theater. August 14, 2012  While most materials remain sealed, those that have been made public contain a glimpse or two about the case being made against James Holmes for the attack that left 12 people dead and 58 wounded. August 13, 2012  The judge also affirmed a gag order, keeping parties involved from talking about the case. August 9, 2012  The revelation came during a court hearing into whether to unseal documents from the case.